What do Air Filters Filter? You are here: Home / General / What do Air Filters Filter? You may know that air filters are an important part of your home, but you may not know exactly why. One question we come across a lot is “What do air filters actually filter?” or “What do air filters do?” If this is on your mind to, you’ve come to the right place. Filters are made up of fibrous material (paper with teeny tiny holes) that help remove nasty stuff that’s in the air. These nasty things in the air are actually invisible to the naked eye, but they’re big enough to not be able to get through a filter. 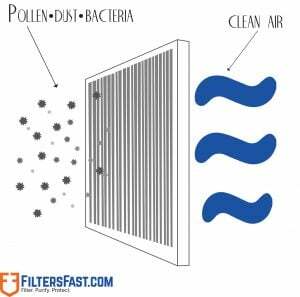 These particles include dust, pollen, mold, and bacteria. Ewww! Plain and simple, without air filters, your lungs will be exposed to a lot of harmful particles that can really affect your health. Remembering to change your filter is annoying and remembering the right filter is almost impossible. But it doesn’t have to be. Sign up for FiltersFast.com’s Home Filter Club and have your filter delivered straight to your door when it needs to be changed. It’s that easy!